Michael Thompson has been looking like he enjoys his home courses at this week's RSM Classic in Sea Island, Georgia. He has posted three consecutive rounds in the 60's (68, 68, 67) and is currently tied for 13th at 9 under par for the tournament. Michael's third round was highlighted by his driving accuracy after hit every fairway off the tee (14/14). He carded a three under par round after making birdies on three of his final four holes. His round was only marred by a single bogey. For Sunday's final round, Michael will be playing with Johnson Wagner and William McGirt. They tee off from the first hole at 10:30am ET. It's been a while since Michael Thompson played a competitive round on the PGA Tour and he lit up the greens in his return. In fact, he hit every single green in regulation at the Shriners Hospitals for Children Open in Las Vegas. That's 18 for 18 if your counting. He carded a two under par 69 and he is currently tied for 29th with a few golfers still needing to finish round one. Any rust from the layoff might have showed up on the greens where Michel uncharacteristically 3 putted three times including his only two bogeys which came fairly early in his round. Michael and his group are scheduled to tee of at 7:15am PT tomorrow. After rehabing his shoulder for the last several months, Michael Thompson is ready to get back to work. This week's Shriners Hospitals for Children Open in Las Vegas will be Michael's first tournament since injuring himself at The National back in June. Michael will tee off in round 1 at 12:05pm PT and will be grouped with Troy Merritt and Richy Werenski. Michael Thompson takes a whack at the miniature golf course at the Travelers Championship. 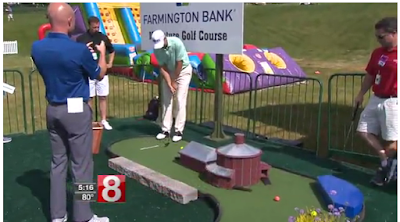 Michael Thompson will be playing the Travelers Championship this week in Hartford, Connecticut but before Thursday's first round, he got some putting practice in the Travelers Celebrity Mini Golf tournament. Putting has certainly been the strength of Michael's game this year as he still ranks 2nd on Tour in the strokes gained putting stat. Michael has made the cut in his last two tournaments and will look to extend that streak this week. Michael tees off from the first hole at 12:20pm ET with playing partners Will MacKenzie and Spencer Levin. After three great rounds of one under par, Michael Thompson put together his best round of the 2017 Farmers Insurance Open on Sunday. He shot a four under par 68 and finished the tournament at seven under par (T14th). It was Michael's third top 20 finish of the year. Sunday's round was nearly flawless. Michael only bogeyed one hole while he birdied five. He was putting great all day as he was making long birdie putts and making crucial par saves. Michael finished the tournament tied for third in fewest bogeys (only 7 for the week) and he didn't card a single double bogey or worse. He also finished the tournament sixth in strokes gained putting and tied for 8th in driving accuracy. I only saw 11 holes yesterday but between yesterday's round and today's I witnessed Michael card a single bogey over 29 holes and go seven under par over that stretch. He made the hardest par 72 course on Tour look easy. I think this might have been the most consistent four consecutive rounds I've ever seen him play live. It bodes well for the rest of this 2016-2017 season. Michael's office was pretty spectacular today. Torrey Pines South Course hole #4. The South Course at Torrey Pines is a beast. There's no two ways about it. It's long. Really long. And to make things even worse, today's soft conditions didn't provide any roll on the fairways which made it play even longer. Michael Thompson and his group played in one of the last groups off the first tee and they played through the windiest part of the day and had to deal with bumpy, crusty greens. Despite all of the difficulties Michael managed to shoot one under par and played great all day. To put Michael's round into perspective, he scored better than all three off the players in the group in front of him: Jason Day, Dustin Johnson, and Tiger Woods. Everyone was missing short putts as the greens were rolling so erratically and the ball was bouncing and veering all over the place. The difficulties meant that you had to stay patient and just roll with the punches. Tomorrow's round is expected to play even tougher as the wind will be gusting up to 40mph. Michael and his playing partners Jon Curran and Morgan Hoffman will be playing the North Course tomorrow at 9:40am PT. Michael Thompson drains his birdie putt on hole #6 on the South Course at Torrey Pines. Michael Thompson signs autographs after round one at the Farmers Insurance Open. After a soggy week in Palm Desert, the sun will be shining this week on Michael Thompson and the rest of the PGA Tour as they compete in the Farmers Insurance Open in San Diego. The weather should provide beautiful vistas of the California coast with plenty of sunshine. The only weather concern will come on Friday when it is expected to be windy. The Farmers will utilize both the North and South courses at Torrey Pines. The South course is the more difficult of the two courses although recent changes on the North course have lengthened it. The South course wass the highest scoring par 72 course on Tour last year. It's narrow fairways, length, and long rough always provide a difficult test. Michael will tee off at 10:50am PT from the first hole of the South course on Thursday. He will be playing with Morgan Hoffman and Jon Curran. They tee off intermediately after the featured group of Dustin Johnson, Jason Day, and Tiger Woods. It should be an interesting exercise in patience as I follow Michael and his group while trying to navigate the crowds. I will try to provide some live Tweets from the course. The South course will have ShotLink coverage so you should be able to follow the leaderboard too. 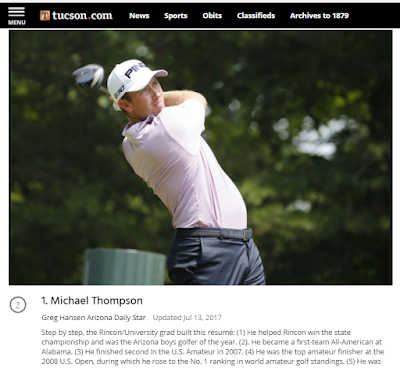 Michael Thompson had a beautiful first round at the Sony Open today. Not only did he go bogey-free for the day, but he carded an eagle on his final hole of the day to finish with a 5 under par (65). He also finished the day tied for 12th. Michael didn't hit as many fairways as he would have liked (7/14) but he managed to recover time and again and hit 16 out of 18 greens in regulation which kept him out of trouble and presented plenty of scoring opportunities. Michael will once again be playing with Marc Leishman and Hudson Swafford for round two. They will tee off tomorrow from the first hole at 7:20am local time (9:20am PT).